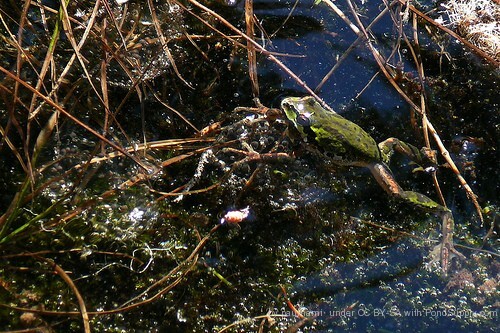 A pond is a fun hangout for you neighborhood frogs. If you have a garden pond or any kind of pond, chances are very high that it will attract any frog in the area. Frogs tend to have a mind of their own and they have the legs to take them wherever they want to go. If you like frogs and enjoy them jumping in your pond or water garden, try and make it a frog friendly pond. There are some easy things to do in order for the frogs to feel at home. Make sure the frog can easily get in and out of the pond. Frogs do not live in water at all times. They come and go as they please and they watch for predators like birds, snakes, and cats. They need to a well-shielded location to easily get in. Plants work great for them to hide among. They blend right in with the foliage. It is a good idea to have plants near your pond, and live in the pond so that the frog can be in hiding along his way in and out. Do not forget that the frog needs to eat. If there are not normally tons of insects around, think of what insects might like to eat. Iris is usually a good choice for this. If you get a good steady insect population, the frogs will naturally be drawn to eat them. If you have fish, be careful and watch out for the big frogs because they might find your fish appetizing. You will also want to keep other predators away like cats and birds. This is hard to do. You can do things to not encourage the burden of birds by having bird feeders around where you have your water garden. Stray cats and animals are impossible to keep away so the only thing for that is just to watch for these frog eating predators. Keep the pond as clean as you can. You also want to keep it as chemical free as you can too. Frogs are very sensitive to chemicals, and you do not want to poison your new little friends. You need to give good balance of shade and sun for the frog so they can regulate their temperature when they need to.